Buttery, chewy Coconut Cookies! 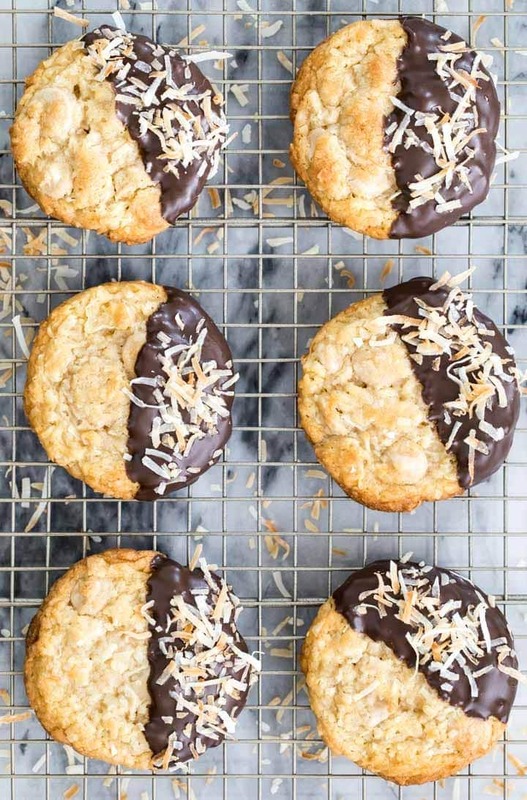 These cookies are made with flake coconut and (optional) caramel chips, then are dunked in dark chocolate and topped off with toasted coconut! These were such a hit with everyone who tried them — everyone was asking me for the recipe! I always feel a liiiitttle bit guilty when I share a coconut recipe because I know that there are a lot of you out there who have made it pretty clear that you don’t appreciate coconut at all (Zach is one of you!). I get it, not everyone likes the texture (Zach wouldn’t even taste-test my coconut macaroons for me! ), but I love it and while I do try to limit the number of coconut recipes that I share, it’s been a while and we’re due for another one. Namely these buttery soft Coconut Cookies. So, coconut haters, I’m sorry, and if you check back on Monday I promise there will be no coconut in that recipe, but for those of you on #teamcoconutcookies, let’s dig in to today’s recipe. The texture of coconut cookies reminds me a lot of oatmeal, and I actually adapted my favorite oatmeal cookie recipe to make these. Use unsweetened flake coconut for this recipe, it can usually be found right next to the sweetened variety in the baking section. Adding caramel chips is optional, but you should definitely add them! I can’t stress enough how tasty these were with little pops of caramel flavor in every bite. I used actual caramel chips and not caramel baking bits (the little balls made of caramel), I used Ghirardelli’s, which are sold (quite appropriately) in a caramel-colored bag. 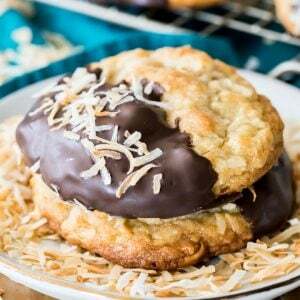 This combo of coconut, caramel, and chocolate reminds me a little of my favorite Girl Scout Cookie — the Samoa. I recommend adding the coconut extract, as instructed, for the best cookie flavor. The cookies will still be good if you leave it out (substitute for vanilla extract, if you do), but the flake coconut doesn’t do much to impart an actual coconut flavor into the cookies, and I liked the taste much better with the extract. Immediately after dipping each of the cookies in chocolate, you can sprinkle them with coconut. I chose to toast my coconut (I like the slightly crisp texture and the way it looks much better that way), so I’ve provided instructions in case you’d like to toast yours as well. To toast coconut for these coconut cookies, spread 1/2 cup of flake coconut evenly across a parchment paper lined cookie sheet and bake in a 325F (190C) oven for about 5 minutes or until the coconut is toasted lightly golden brown. Allow the coconut to cool before sprinkling over dark chocolate, but sprinkle immediately after dipping in chocolate or it won’t stick, so if you plan to use toasted coconut make sure you have it ready in advance! Just to be clear, I did not toast the coconut that went into the cookies, just the last 1/2 cup that I used for sprinkling on top of the cookies! Buttery, chewy Coconut Cookies! 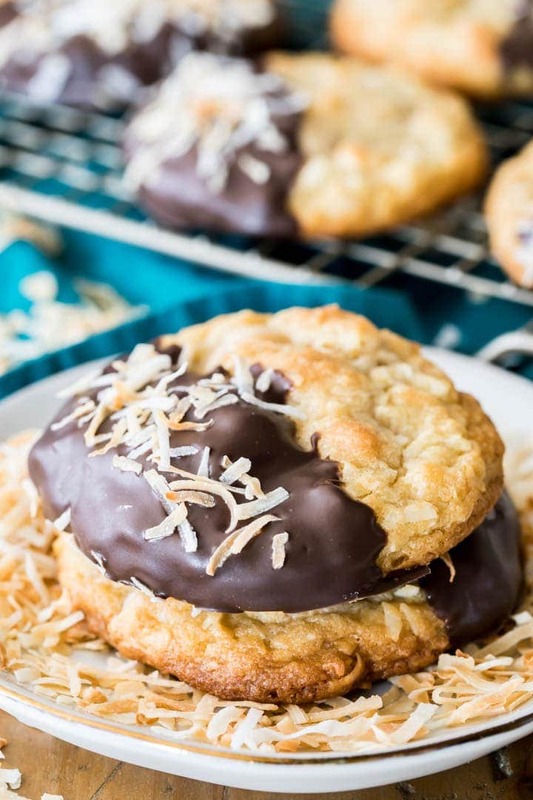 These cookies are made with flake coconut and (optional) caramel chips, then are dunked in dark chocolate and topped off with toasted coconut! Stir in vanilla and coconut extract. Gradually stir in 3 cups coconut flakes and caramel chips until completely combined. Drop cookie by rounded 2-3 Tablespoon-sized ball onto parchment paper, spacing at least 2" apart (for very round cookies, briefly roll between your hands to form into smooth balls). Allow cookies to cool completely on cookie sheet before dipping in dark chocolate (if using). If dipping in chocolate: Prepare melting wafers according to package instructions, heating until melted. Dip cookies about 1/2-way into the chocolate and transfer to wax paper. Sprinkle with remaining 1/2 cup coconut (if using) and allow chocolate to set before serving. 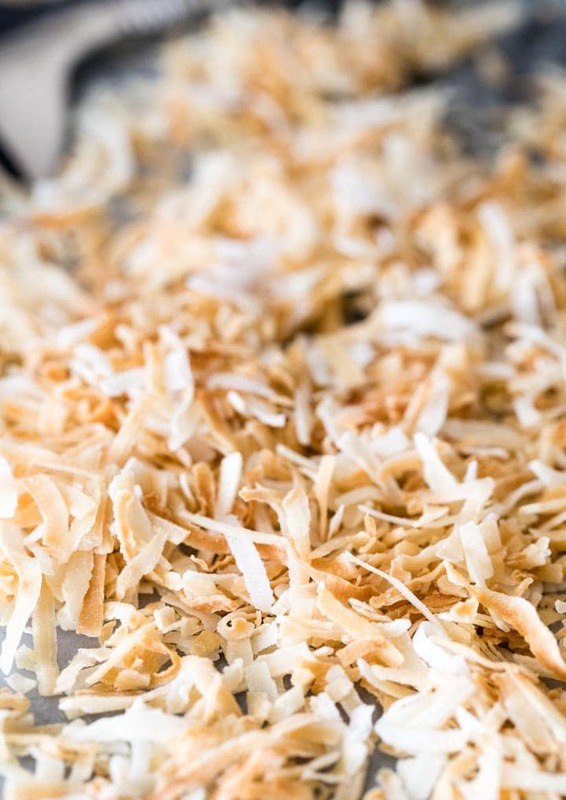 If you do want to make and add toasted coconut, spread the 1/2 cup of your remaining coconut evenly across a parchment paper lined cookie sheet and bake in a 325F (190C) oven for about 5-7 minutes or until lightly golden brown. Allow to cool before sprinkling over dark chocolate, but sprinkle immediately after dipping in chocolate or it won't stick! **Alternatively you can use 1 1/2 cups of melted semisweet chocolate chips or chocolate bar, just keep in mind that the chocolate will take much longer to harden. Any high altitude changes before I start these? I’m at 4500 ft and usually have to follow high alt directions. Just a guess, but that could be the reason for the flat cookies mentioned in other reviews .. I like the specifics & details on how to have the cookie come out perfectly. Coconut flavored is one of my favorites..I look forward to trying & enjoying this one. Also, thanks for the toasted coconut hint in the oven rather than on the stove. Can these be rolled out with cookie cutters into shaped cookies, and then piped with dark chocolate and coconut flakes??? Hi Dina! Unfortunately they will not hold their shape and the dough is too sticky to roll out. I was very much looking forward to these cookies since I love coconut and thought the caramel chips and dipping in chocolate would be heavenly. I have no idea what the issue was, but mine turned out so badly that they all went into the garbage. I am 100% sure I followed the recipe perfectly. I refrigerated the dough a good 45 mins before rolling them into balls. I spaced them a good 3″ from one another. The results? Totally flat, buttery greasy, and humongously big. I tried making them smaller and the same happened again, except the smaller ones didn’t combine with each other. I was happy that I didn’t melt the chocolate and that I had some reserved coconut (the amount I toasted). Yes, the coconut was unsweetened, and unless Whole Foods market butter is considered crap, I’m not sure what happened. I’m very disappointed to hear this, Elaine. My best guess would have been that the flour wasn’t measured properly or too much baking soda was accidentally used but it sounds like that is not the case with your cookies. Another guess could be that your oven is running much cooler than it’s reading, but that’s just a guess, I’m really not sure why they would have spread so much otherwise but I am very sorry to hear they weren’t a success for you! Hi again Elaine! I just tried this recipe again just in case maybe I’d made an error (all of my recipes are tested at LEAST 2-3 times, but we’re all human and you never know, right?). They came out just as pictured for me again, thick, chewy, no spreading as you described. Because of this, I’m confident in the recipe as written and I’m wondering if perhaps your baking soda is bad or expired? If it’s old that might be the problem with the cookies spreading too much? If there’s anything else I might be able to help troubleshoot with the recipe I’m all ears. I take my recipes very very seriously and want you to have only the best results in your kitchen! Coconut and chocolate is my all time favorite. These look amazing and I can wait to make them. Do you know if they will freeze ok? I like to get a head start on my holiday baking. I love these cookies!!! I made them with my son, and they turned out perfect. I only had sweetened coconut flakes so I omitted the white sugar and that seemed to do the trick. There wasn’t any extra spreading of the cookies. Also, we used the caramel bits instead of the chips because that was what I had available. They turned out great! I LOVE coconut, so this had me written all over it. Then to add in caramel, definitely a must bake! Unfortunately, out of 4 stores I went to in my town, nobody had caramel chips 🙁 Very sad. But I made these anyway. Some I have left plain by request, the others that I dipped in chocolate are now on the wire rack waiting for the chocolate to harden. I melted milk chocolate chips. I did try one and wow these are good and coconut-y! I want to hunt down the caramel chips and make these again. So far, even without the caramel, these are becoming a big hit. Thanks for sharing! I am so glad everyone enjoyed them, Megan! If you can’t find them in a store, can you find them on online by chance? They are definitely an awesome addition. Not sure what I did wrong, but they came out flat. I made the first batch and halved it and they spread like mad. But, they tasted really good. Sooooo, today, I made another full batch thinking I didn’t let them sit in the fridge long enough, Nope!!! They spread out too! Sorry, won’t be making this cookie again. I’m sorry to hear they didn’t turn out for you JoAnn! You didn’t by chance use sweetened coconut, did you? I know how disappointing it can be when a recipe doesn’t turn out, if it’s particularly hot/humid in your house they may also need a bit more chilling time. That is true. I have found European butters are the best for cookies. Really gives them a rich, buttery flavor. These were delicious. I will be making again. Thank you for the recipe! Made these for my boyfriend and his dad for their birthday, both of them are huge coconut fans, they loved them! I’m not huge on coconut but I tried a small bite and thought they were good. I let my mom have a few, being the generous person I am, and she loved them as well, she’s also big on coconut! Thank you, Sam, for sharing such an awesome recipe! We LOVE coconut!!! These cookies need to be baked by me this weekend!! Hi Sam, I love anything with coconut in it, so please keep those recipes coming 🙂 🙂 However, I wanted to ask you a couple of questions about 2 of the ingredients that you have listed in this recipe. Would there be a problem using the regular sweetened coconut flakes instead of the unsweetened coconut flakes? Also, we are not fans of the taste of caramel, so could I substitute chocolate chips for the caramel chips? Thanks, Sam! I’m so glad that I’m not alone in my love for coconut! 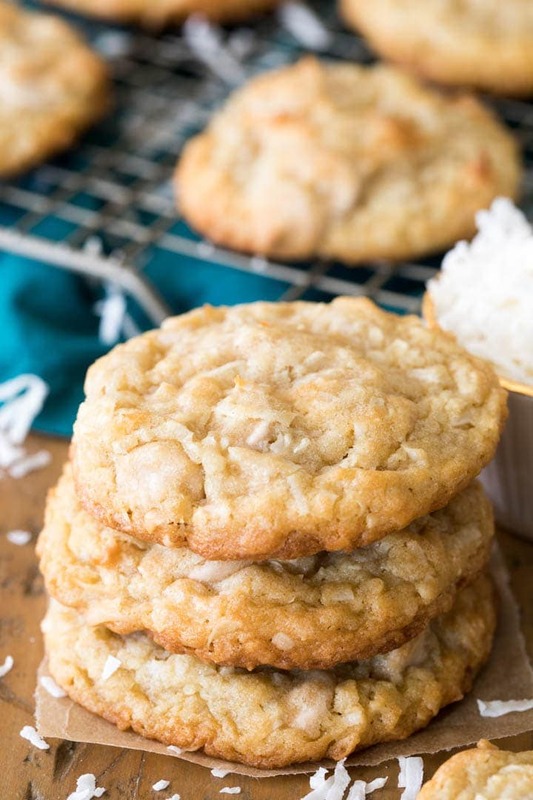 For the coconut, I found that the cookies seemed to spread more and it made them sweeter if I used sweetened coconut (I’m guessing because there seems to be more moisture in the sweetened variety), so I recommend using unsweetened. I LOVE all things coconut! These look delicious! Pinned for later! I’m so glad to hear I’m not the only one! I hope you love the cookies, Mary!! Delishous! I’m baking these Tonite. My grandson brought these cookies today , made fresh at culunary class. Loved them!!!! !